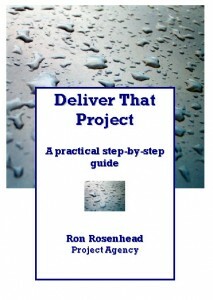 To get your copy of a great training guide – Deliver That Project, simply click the buy now button below. It’s only $27 – note; your bill will be converted to your local currency. Ron, thanks, thanks, thanks….this book helped me so much! I faced a really tough deadline with no idea how to reach it. Came across your stuff, the free course and the book and bought it. This book is worth a ton of money. Keep up the great work. I liked the style. It’s almost as if someone is speaking at you helping you along the way. I delivered my project and could not have done without this book. Save time, save money by going on a course; buy the book instead.